TOKYO — Japan’s governing Liberal Democratic Party re-elected Prime Minister Shinzo Abe as its president on Tuesday after his potential rival, Seiko Noda, failed to achieve enough support from lawmakers to contest the post. Mr. Abe will remain party leader for a second three-year term. 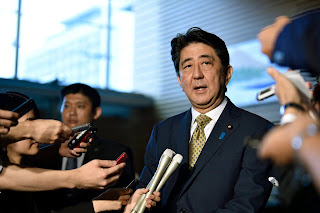 “I think the majority of the party lawmakers think we should work as one carrying out our responsibility for the Japanese people,” Mr. Abe told reporters. “Abenomics is still halfway through. I would like to bring the virtuous circle of the economic recovery to every corner of the country, promote revitalizing local economies and accelerate the recovery process from the disaster.” He was referring to the earthquake and tsunami that struck northeastern Japan, including Fukushima Prefecture, in 2011, the year before he took office. Mr. Abe also pledged to push forward with his plan to permit Japan’s military to be dispatched to conflicts abroad, which has been banned for 70 years under the pacifist Constitution. Legislation allowing that change is expected to be enacted next week, despite rare large-scale protests across the country.